It’s a fast turnaround for the former Terrine on Beverly, which closed rather suddenly on New Years Eve. Now the place is finishing a flip as a new Italian restaurant to be called The Ponte, and it’s got the chef-kiss blessing of none other than Scott Conant. As you can see from the above shot, taken today, there’s a fresh coat of paint on the outside and some tinkering being done in the dining room. Functionally though this will be the same look and feel as Terrine (along with the same patio), and will even involve some former employees. Now Conant and restaurateur Stephane Bombet are targeting an opening date for Tuesday, February 21. That means they’ve got just over a week to finalize things (but judging by social media the group has already been doing plenty of cooking in the kitchen) before going live. As for the opening menu, you’ll find that below. Conant is getting back to basics post-Scarpetta, which means you’ll find his signature spaghetti pomodoro as well as duck agnolotti with foie gras, a collection of charcuterie and salads, and larger mains like chicken, steak, and trout. Knowing that Conant is more of a traveling overseer of restaurants than a full-time lead on the line, The Ponte will be overseen day to day by none other than Freddy Vargas. He worked the kitchen for years at Scarpetta and for a time once that place transitioned over to Georgie, but now is back in the saddle with Conant, readying the place for that next Tuesday opening. “Scott Conant’s The Ponte Stirs Pasta and Cocktails on Beverly Next Week.” Eater LA – All. 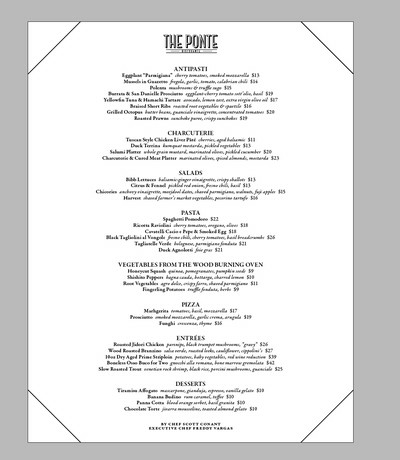 http://la.eater.com/2017/2/13/14601526/the-ponte-opening-menu-scott-conant.